It’s hard to think of Malaysia and not visualise gorgeous, tropical beaches. In fact, I think most people planning a trip to this part of the world are going to want to include at least one of these Malaysia beach holiday destinations during their time in the country. To make it easier to plan your best beach holiday in Malaysia, I asked some of my friends to tell me their pick of the best Malaysia beach destinations. Below, you will find our list of the top 19 best beaches in Malaysia. I have broken up this list by whether the beach is located on an island, peninsular Malaysia or East Malaysia (Borneo) so you can pick your best beach holiday destination in Malaysia based on where you will be travelling. Most of Malaysia’s best beaches are located on the many islands that dot its coast and this can be a great option. Most islands are easy to reach and the most popular ones, Penang and Langkawi, even have international airports so you can fly right in and be at one of the best beach destinations in Malaysia within an hour of arriving in the country. Batu Ferringhi is located on the island of Penang. It is a popular tourist destination making it maybe the most famous beach in Malaysia, and there is a great strip of restaurants and shops here including a great night market. It’s a great place to not just hang on the beach but enjoy some of the best food in Malaysia. It’s also where you will find the majority of the best hotels in Penang. Batu Ferringhi won’t win any prizes for the the most beautiful beach in Malaysia but it does have character. It also has buzz and the great food previously mentioned. I also loved that it has water sports readily available for a good price and I recommend you go parasailing while you are here. I consider it the best beach in Penang Malaysia for these reasons. There are buses here from the airport and Georgetown and taxis are readily available. Our favourite place to stay is the Shangri La Rasa Sayan,g but if you are on a tighter budget the Bayview Beach resort is a solid choice. Datai Bay in Langkawi is a gorgeous stretch of secluded sandy beach. This is a beautiful, naturally rugged beach where the rainforest meets the ocean and has previously been named amongst the ten best beaches in the world by National Geographic. Unfortunately, Datai Bay is a private beach in Malaysia and is only accessible to residents at the two luxury resorts located on the beach here – The Datai and The Andaman. The good news is, if you do check into one of these resorts, you will never have to compete for somewhere to put your sunlounger as it never gets crowded here. Beyond the sand and the ocean, Datai Bay is also a paradise for nature lovers. You will find monkeys playing in the nearby trees and hornbills nesting above your head as you enjoy sunset cocktails at one of the hotel beach bars. The rainforest here is also renowned as the best place in the world to spot the cute flying colugo. Datai Bay is around a 40-minute drive from Langkawi airport. Best Accomodation: The Datai Langkawi Click here to see the latest prices and The Andaman Click here to see the latest prices. If you are looking for luxury beach holidays in Malaysia, check out the private pool suites at The Andaman. Cenang Beach is located on the western coast of Langkawi only a short 10-15-minute drive from the Langkawi Airport. Cenang Beach is the most popular beach in Malaysia and is where you will find many places to stay, restaurants and shops. Despite being a fairly touristy spot, Cenang is still a gorgeous beach. The beach is long and curved with white sand set against calm emerald bluish water and with various other lush islands in the background. During the day, you will find plenty of water sports such as banana boat rides, paragliding, jet skis and other island-hopping tours departing from here. There are plenty of sun loungers you can hire and vendors selling drinks and snacks. At night time, the beach bars and restaurants are the place to be and it’s the perfect spot to watch the sunset. Just after dark be sure to stick around for the fire dancers that make their way from bar to bar. There is plenty of accommodation along Cenang from budget to luxury and every price point in between. For budget accommodation, I recommend the Malibest Resort which offers fantastic value for money in spacious family sized rooms perfect for family beach holidays in Malaysia. If you want something a little more luxurious stay at the Meritus Pelangi Beach Resort & Spa. To get to Cenang will depend on where you are coming from, but usually you will fly from Kula Lumpur Airport. The most Northern point of Langkawi is home to Tanjung Rhu beach, a magnificent stretch of powder-fine, white sand beach in Malaysia and is surrounded by crystal clear waters. If you are a beach bar lover or in dire need of some entertainment, you’d better think twice, because this beach is all about solitude and peacefulness. Surrounded by limestone crags and mangroves, Tanjung Rhu is absolutely stunning and the perfect place to spend a couple of days. There are only three hotels to choose from: The Four Seasons for those seeking the ultimate luxury experience, Tanjung Rhu Resort which offers a pristine setting for a very decent price and Labu Labi Residence, with simple chalets right on the beach. Along the road are a couple of roadside stalls and right next door to Labu Labi is a fish & chips beach joint that offers a diverse enough menu to last at least a couple of days. But that’s about it in terms of restaurants or shops. And as it is such a secluded area, getting there and away is limited to rental cars, scooters or taxi services. Apart from the obvious beach fun, you can take a tour to nearby mangroves or walk along the beach to the mysterious Pantai Pasir Hitam (Black Sand Beach), a photogenic almost black beach with an old wooden jetty and more facilities. There are many amazing beach places in Malaysia, my favourite is off the coast of Langkawi and is a little man made island called Paradise 101. The island was created as a day trippers paradise offering exciting activities for all ages. We took our kids over aged 12,10 and 8 years and we did lots of fun activities during our day visit including playing on the aqua inflatable park, zip lining, jet skiing, banana speed boat rides, beach volley ball and now you can even paraglide. The NAAM Team that manage Paradise 101 provide a buffet lunch for day trippers and there is a breathtakingly beautiful sunset deck and sunset bar for those that wish to watch the sun go down before getting the boat back to Langkawi. Like everywhere in Malaysia, food and beverages are a reasonable price on Paradise 101. There are bathroom and shower facilities to freshen up before heading back to Langkawi. There is no accommodation on Paradise 101 however there is plenty on Langkawi and getting across to Paradise 101 only takes 5 minutes. We stayed at the Meritus Pelangi Resort and I highly recommend this hotel and found it to be extremely family friendly. Located on Cenang Beach, its a short walk to various bars and restaurant if you don’t want to pay resort prices and only 10 minutes from the airport. 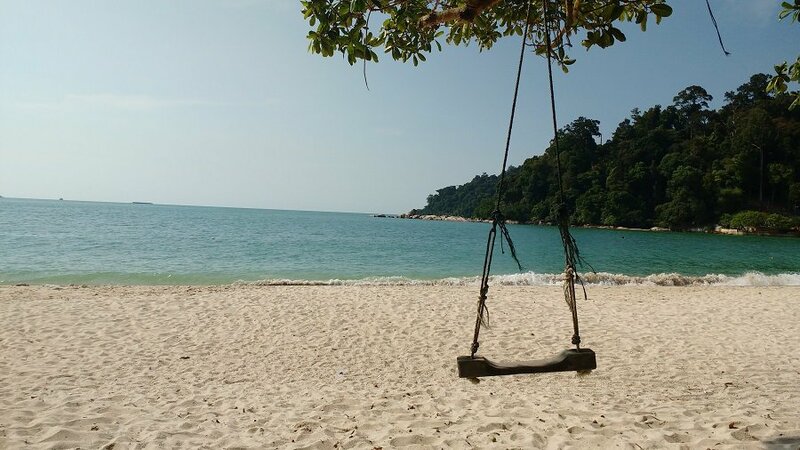 Teluk Nipah beach is on the western side of Pangkor Island which in turn is on the western side of mainland Malaysia. With soft white sand backed with palm trees and warm clear seas, this is a typical tropical paradise but here (at the moment) the big developments haven’t taken over. The beach is lined with seafood restaurants and souvenir shops and you can take any number of boat rides or snorkelling trips from here, but to avoid the crowds, walk a little way around the corner and to the north and onto a quieter stretch of beach that has a much more chilled vibe. Beware of marauding troops of monkeys who will steal food or your sunglasses, but otherwise, pick your spot and relax. The sea here is generally calm, clear and warm and the trees that entertain the monkeys and the hornbills provide welcome shade. Getting around Pangkor Island is easy if you can ride a scooter. There’s one main road that runs around the perimeter so getting lost isn’t an option but if you don’t want to hire a scooter, you can take one of the pink minivan taxis. A huge choice of hotels and guesthouses are clustered around this part of the island close to Teluk Nipah beach that you can simply walk to. Pangkor Island is often overlooked in favour of the beaches on the east coast but it’s certainly a little paradise and is my choice of the nicest beach in Malaysia. Pulau Besar is an island which lies off the east coast of Malaysia. To reach the island you must depart from Mersing Jetty. Mersing can easily be reached by bus or car from both Kuala Lumpur and Singapore in around 4 hours. Speedboat can have you at the island within 20 minutes and checking in to your accommodation at one of the two simple rustic resorts on the island. The beach right out the front of Asia Scenic resort has the whitest sand to lie on or play with the kids making it the best beach in Malaysia. The clear water is warm and a little further out is beautiful for snorkelling and exploring the underwater world. After dinner and watching the sunset. there is the perfect spot to enjoy a game of volleyball or have a turn on the giant rope swing. Redang island is located on the east coast of Peninsular Malaysia. It’s one of the best islands in Malaysia famous for its crystal clear water and white sandy beaches, making it a popular spot for snorkeling and diving activities. There are plenty of flip-flop friendly trek routes, making it easy to explore the island and get to know the rare flora and fauna on the island. The preferred gateway to Redang island is Kuala Terengganu, which is a one hour flight away from Kuala Lumpur. Once you reached Kuala Terengganu, make your way to either Shahbandar jetty or Merang jetty depending on the ferry you’re taking. There is a small marine park conservation fee to enter the island. The ferry ride should take approximately 45 minutes to 2 hours. Some resorts operate private ferries that brings you to the resort. So make sure you check with your resort on the package you’re getting to avoid confusion. There are plenty of resorts on the island, the one I recommend is Taaras Beach and Spa Resort. The is the perfect place for a beach getaway in Malaysia. Tips: Food is very expensive and there are no ATMs or banks on the island so do make sure to bring enough cash for your entire stay. When it’s rainy season in most parts of Southeast Asia, you can still find a few wonderful beaches without the rainy weather on the east coast of the Malaysian Peninsula. One of them is located on the Pulau Perhentian Kecil, the smaller of the two Perhentian Islands and is called Long Beach. It’s the perfect spot for a beach vacation in Malaysia. This beach is great for all kind of travelers. On the one hand, you can find an amazing white sand beach to enjoy. Just use one of the sunbeds offered by the resorts, order a cocktail and relax in the sun all day long. If you are looking for more action, Long Beach is full of diving schools and travel agencies that offer snorkeling tours. The prices for diving here are among the cheapest in the whole of Southeast Asia and the diving trips will definitely not disappoint you. You can see amazing fishes and even some little sharks but the true highlight is seeing turtles under water. In order to reach the Perhentians and the Long Beach, you have to take a 40-minutes boat journey from Kuala Besut. Many of the accommodations (especially the budget options) on the island are not bookable online, so make sure to get there early and find a suitable accommodation on-site. A short swim from the shoreline, we spotted five, ten… thirty species of fish, including lots of clownfish, a stonefish, as well as a ray. We later joined a snorkelling tour of the Perhentian islands, only to be somewhat disappointed until the final stop at ‘turtle point’, which literally sits just a stone’s throw from our bungalow balcony on this beach. There is so much to love about this secluded stretch of sand in addition to snorkelling. We would wake to the sound of the silvered-leaf langurs eating through nearby mango trees, and then there’s the relentless call of nature from the dense hillside forests that surround this beach. It felt like our own private slice of paradise, as we were staying in the only hotel (the Perhentian Islands Resort) located along this secluded cove at Teluk Pauh Beach. However, it is still accessible by a wooden cliff walkway from elsewhere on the island of Perhentian Besar, as well as the hotel jetty when arriving from the mainland or surrounding islands. Tioman is one of the amazing islands which can be found in Malaysia and is located just of the southeast coast (of Peninsular Malaysia). It’s a relatively small island, about 10 km wide and 20 km long. However, many of the best beach places in Malaysia can be found here! My favorite one was the beach in Salang, a tiny village and the last stop of the jetty serving Tioman Island. The beach in Salang is everything you imagine when thinking of a tropical paradise. There are large palm trees, white sands and a crystal-clear blue ocean. If you decide to venture into the water be sure to bring your goggles along as the water around Tioman island is a marine reserve. In this amazing underwater world, you can find lots of coral, colorful fish and even a turtle if you are very lucky. There is a ferry leaving from Mersing twice a day, Salang is the last stop of the jetty. Tickets can be bought at the jetty office. Accommodation in Salang is basic (think bed, cold-water shower and fan). There are no large and luxury resorts. We stayed at Ella’s Place which is located at the end of the beach. Because Tioman can be easily reached from Kuala Lumpur and Singapore, weekends can get busy. If you want to avoid the crowds, it’s best to visit during the week. Juara beach on Tioman Island may be the best beach area in Malaysia because it is a secluded paradise spot with a special turtle conservation project. Here, you can see baby turtles hatching and taking their first steps into the sea. Juara beach is a four-wheeled drive taxi over the island’s steep terrain from the island’s marina and airport. 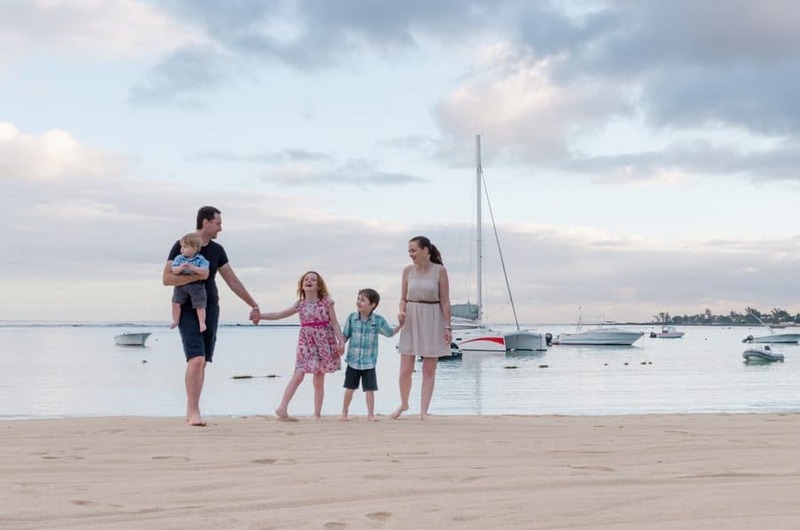 Here, you will find a good selection of beach huts and resorts for different budgets, sitting directly on the pristine sandy beach in a tranquil setting. If you fancy a short trek, there is a waterfall and small lagoon hidden in the nearby jungle, where you can take a refreshing dip. Tioman is also popular for snorkelling and scuba diving as it has beautiful coral reefs. At the Juara Turtle Project, you can learn about the crucial work the volunteers here do every day to protect the area’s endangered turtles. At this sanctuary, they look after hatcheries and, if you are very lucky, you will see the new baby turtles emerge from the eggs. This is a special moment, as the turtles make their way into the waves at sunset to start their lives in the wild. Cherating might not be the prettiest beach in Malaysia, but it will probably win the prize for best sunsets and the laidback atmosphere here among travellers in Malaysia. It is located on the east coast of Malaysia 30 kilometres north of Kuantan, the largest town on the east coast of Peninsular Malaysia. The beach here itself is not as nice as on the islands of the coast of the country, but what it lacks in beauty, it does win back in coolness. Cherating has the most laid back atmosphere of all the Malaysia beach vacation spots. Nobody stresses around here, but If you don´t want to just relax at the beach can you go surfing or take a short day trip to a Turtle Sanctuary (August – October) to experience the rare Leatherback Turtle, the largest of all turtles species. In the evening, the Little Bali is the best place to hang out, with cheap beer and live music. The best place to stay is at the Coconut Inn Cherating, with different budget style small huts. For an under the radar best sea beach in Malaysia, head to the little community of Balok, north of Kuantan in Pahang on the east coast of the Malay Peninsula. One of the best things to do in Kuantan we found was rising at dawn to walk the Balok beach. The South China Sea sunrises were among the most spectacular we’ve seen in four years of full time world travel. Balok beach is virtually deserted at this hour, so it’s a wonderful way to get centered at the beginning of the day. Don’t miss the weekly Wednesday outdoor market in Balok town for delicious local food. You’ll likely not see another Westerner during your stay, even at one of the higher end resorts like Swiss Garden Beach Resort or the Swiss Garden Residences. We were charmed by the welcome we received and felt we had a more authentic Malaysian experience than we might have had in more heavily touristed locations. To get to Balok beach: fly into Kuantan directly from Singapore or Kuala Lumpur. Taxi and shuttle services will take you to your accommodations, about a half hour up the coast. Malacca is known best as culture hub with reminders of Malaysia’s history and glory under the Sultanate dynasty. However, there are some untouched beaches in Malacca away from the bustling town. Tanjung Bidara beach is a public beach which is tranquil and ideal for families. The beach faces the Straits of Malacca and is located next to Terendak Camp, a military camp situated off the highway. This beach is about two hours away from Kuala Lumpur and very close to Melaka town center famous for its historical buildings and food streets. While the water is murky, the beach is lovely with its white soft sands and surrounded by trees overlooking large boulders. You will also find some food stalls and souvenir shops near the beach in the evening. An offbeat beach in Malacca, you would need to pass through paddy fields and farms to reach the beach. While there is a beachfront hotel on the beach, I recommend staying in town where you would have different options for accommodations to choose from. If you are looking for a beach in Malaysia near KL (Kuala Lumpur), Port Dickson is your best bet. Kuala Lumpur itself is not on the coast but is only an easy hour and a half’s drive from Port Dickson where you can find several beaches including Saujana Beach pictured above. You can read more about getting from KL to Port Dickson here. The beaches are good places to relax and perfect for kids or non-swimmers as there is no surf and shallow water for a long way out. They are popular with locals and hanging out here can feel like a less touristy experience than many others in Malaysia. 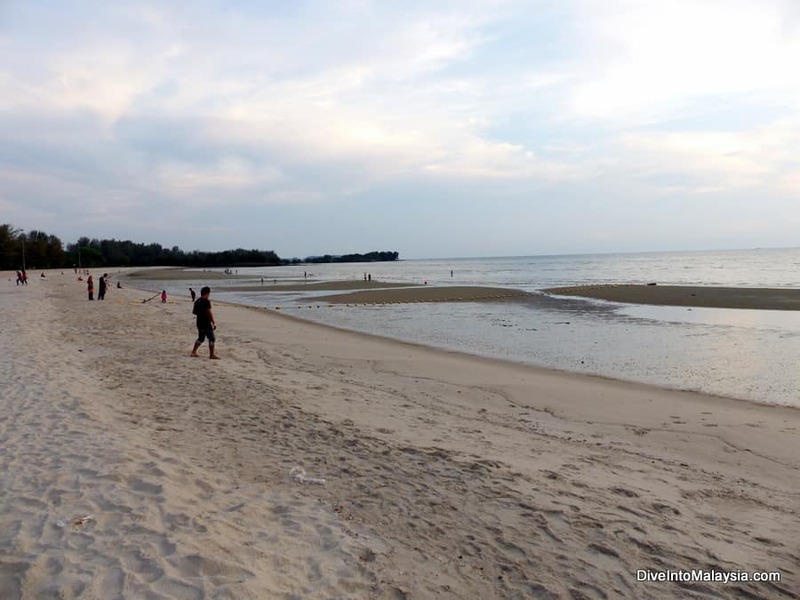 Saujana Beach is about a kilometre long and is especially popular in the evenings. It’s right next to the lovely Avillion Resort and there is a playground, changing rooms, toilets and food and drink vendors. Read more about the best Port Dickson beach here. Borneo is famous for its natural setting and you can find some great beaches here. The wild jungle beaches of Bako National Park charm nature lovers with unique wildlife sightings. Picture nosy proboscis monkeys playing in the palm trees, Bornean bearded pigs traversing the white sand, and hornbills flying upon the forested cliffs surrounding the secret coves. Beaches of Bako National Park can be accessed by hiking or renting a boat. Hiking from one beach to another in Bako National Park was among the highlights of our 2-week trip in Borneo. Although the South China Sea invites you to take a refreshing plunge, swimming is not recommended due to the crocodiles. Bako National Park is known for its incredible biodiversity. It’s also the best place in Sarawak to meet wild proboscis monkeys. The best beach for spotting proboscis monkeys is Teluk Assam, just beside park HQ. Bearded pigs frequent the same stretch of sand, so you don’t even need to hike to meet the stars of the jungle! Bako is the smallest – and the oldest – national park in Sarawak. It can be explored on a day trip from Kuching if you leave early enough to allow at least six hours inside the park. Bako is just 37 northeast of Kuching: the drive takes less than an hour. Hourly buses from Kuching arrive at Bako Bazaar (the gate of the national park), from where it’s a 20-minute boat trip to the national park. Bako has also basic accommodation if you’d like to extend your adventure. If you’re looking for white sand beaches with snorkelling opportunities, crystal clear water and the chance to find a secluded spot to yourself then the Tunku Abdul Rahman National Park is a must visit in Malaysia. The five islands which make up the National Park are located just a 15-minute ferry ride from Kota Kinabalu on Borneo’s north coast. The most popular islands are Sapi and Manukan but we loved the peace of Mamutik Island which was our best Sabah beach. Ferry companies sell affordable tickets out to the islands and you can choose one or any combination to island hop throughout the day. If you’re a larger group, you can charter your own boat and go at your own pace. Snorkel gear is cheap to hire at the jetty before you leave and all of the islands offer diving opportunities. If you feel like a bit of luxury check out the resorts on Gaya Island which offer private beaches and access to the beauty of the island without any other tourists about. What’s your favourite of the best beaches in Malaysia? Looking for the best beach resorts in Malaysia? Find them by clicking here! You can find more awesome destinations to visit in Malaysia here and find more Malaysian beaches located near Kuala Lumpur here. If you’d love to see underwater while you are in Malaysia, check out the best Malaysia diving spots here.Or you can find our list of the overall best resorts in Malaysia here.